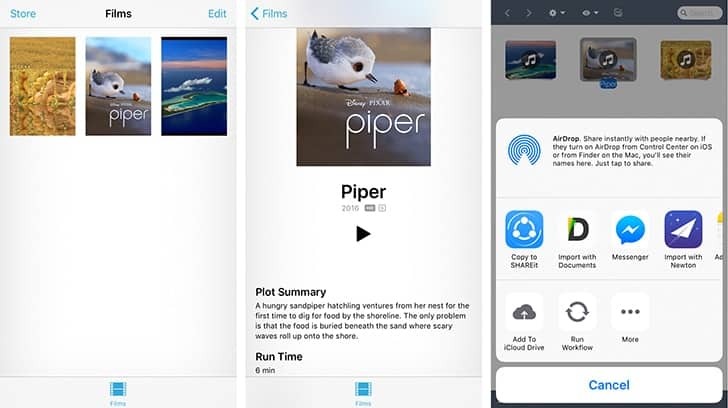 When you transfer videos from a computer to an iOS device, it is recommended to use iTunes sync or any other alternative solution that puts your videos in iOS’s native Videos app. This is because Apple’s home-brewed native apps are fully optimized for speed, power efficiency and seamless user experience. But in terms of functionality, there’s not much that the native Videos app has to offer, except perhaps, playing videos. Now, some of you may want to argue that the app does what it is supposed to do, and you’re right. But let me put you in a situation here; what if you wanted to share those videos (stored in the Videos library) with another person, or export them to another app. The answer is, you can’t. The native Videos app just doesn’t allow you to share or export content, even via AirDrop. It should allow access to the native Videos library. It should support the Open With feature. Any third party app that offers the above two features, qualifies as a suitable app for this workaround. Download and install PlayerXtreme Media Player from the App Store. Download and install Documents app, if you don’t have it installed already. Launch PlayerXtreme and tap on the hamburger icon at the bottom to reveal the menu on the left side. Select Videos from the menu; you would be prompted to allow PlayerXtreme access to your Media Library. Tap on OK to allow access. You will now be able to view the videos stored in the native Videos app. Tap on a Video to reveal associated options, and choose “Open With…” option. This will bring up the Share menu. Choose Documents from the Share Menu. The video will start playing in Documents app. A copy of the video will also be stored in Documents’ in-app storage. Note: You can similarly export videos to any other supported app or share them directly using Mail, Messages or AirDrop from the Share menu. What do you think about the above workaround? Let us know about your opinions in the comments below.